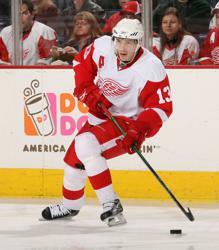 Until the age of 11, Detroit Red Wings star Pavel Datsyuk grew up learning to play hockey through small-area games on the natural ice between apartment buildings across Russia. The three time Selke Trophy award winner, who supports USA Hockey's American Development Model, credits small-area games for developing the skill and awareness that he brings to his play in the National Hockey League. "It is great to see USA Hockey take the steps necessary to increase the skill of their players at young ages," said Datsyuk. "The lessons learned in playing cross-ice hockey parallel what I learned during my youth playing in Yekaterinburg, Russia." Research shows that players who are trained in small areas get more puck touches, develop an ability to handle the puck in tight spaces, become more comfortable with body contact at an earlier age and are put in more situations that develop natural hockey sense and ice awareness. The ADM program for children 8-and-under includes a practice structure that roughly doubles the active development time when compared to a traditional practice. The station-based practices provide a constant challenge to players of different abilities. With six-to-eight players in each group, coaches can adjust the difficulty of a drill at each station based on the ability level of the players in that group. During games, players are matched against opponents of equal ability. The Potomac Patriots are proud to support USA Hockey's American Development Model! MORE touches of the puck. MORE changes in direction, for better agility.